Daimler CEO Zetsche: "We plan to grow with the next generations of the A class and B class." FRANKFURT (Reuters) -- Daimler CEO Dieter Zetsche hopes to return the automaker to the top spot in the premium car market ahead of Audi and BMW by 2020, he said in an interview with a German newspaper. "I am confident that we will be ahead of our rivals by 2020 at the latest," he told Boersen-Zeitung in an interview published on Saturday. He said he hoped to reach that target during his time in office. 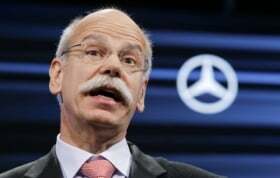 Zetsche's contract currently runs until December 2013 but is expected to be extended by three years in February. Daimler has already promised 2 billion euros ($2.6 billion) in cost cuts at the Mercedes-Benz division by the end of 2014 after warning in October that it would miss its operating profit target this year by 1 billion euros. Zetsche told the newspaper Mercedes had failed to keep up with its rivals in the compact car market and in China. With the debt crisis depressing demand in Europe, Germany's luxury-car makers have maintained growth by selling vehicles in the United States and China. BMW, Audi and Mercedes-Benz are all targeting record sales this year, while mass-market competitors in Europe are bracing for the lowest sales in the region in nearly two decades. BMW is expected to strengthen its dominance of the luxury-car industry next year. The Munich-based carmaker will increase sales 4.6 percent to 1.54 million vehicles in 2013, beating Audi's 1.1 percent growth to 1.44 million autos, according to estimates from industry researcher IHS Automotive. Mercedes, which was passed in sales by Audi last year, will retake the No. 2 spot next year, with sales of 1.46 million vehicles, IHS predicts.